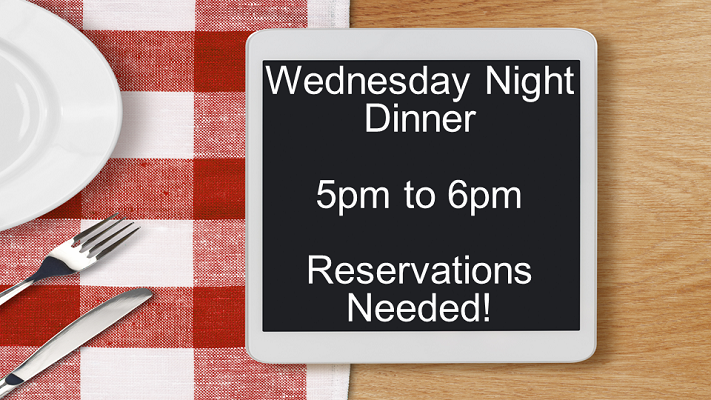 Members and guests are invited to join us for our Wednesday night dinner. The Wednesday Night Dinner is served from 5:00 – 6:00 p.m. in the fellowship hall every other month before our church business meetings. Reservations can be made through the church office at 410-766-2588, by the form below or the sign-up sheet in the KidZone area. Deadline for reservations is Noon on Monday of that week. If you are making a reservation after Monday, please call the church office at 410.766.2588 to check availability. The cost is $5.00 per person. Maximum for a family is $10.00.